My family has finally dragged itself out of a two week stomach virus extravaganza. It was not pretty in our house. One by one we all went down. Even my poor sister visiting from England was not spared the joy of the family sicky bug. Thankfully, however, it was staggered enough to always leave one of us able to nurse the others. And now we are back and trying desperately to give our overworked immune systems a nice boost. So I bought some fresh turmeric and ginger, and set about making a tropical turmeric smoothie to get us back to full health. Curcumin, a compound found in turmeric, has many excellent health-promoting properties. It is a potent anti-inflammatory and antioxidant. It has also been shown to have protective effects against heart disease, depression, Alzheimer’s, cancer, and arthritis. These wonderful accolades make it a hot ticket item in our kitchen. 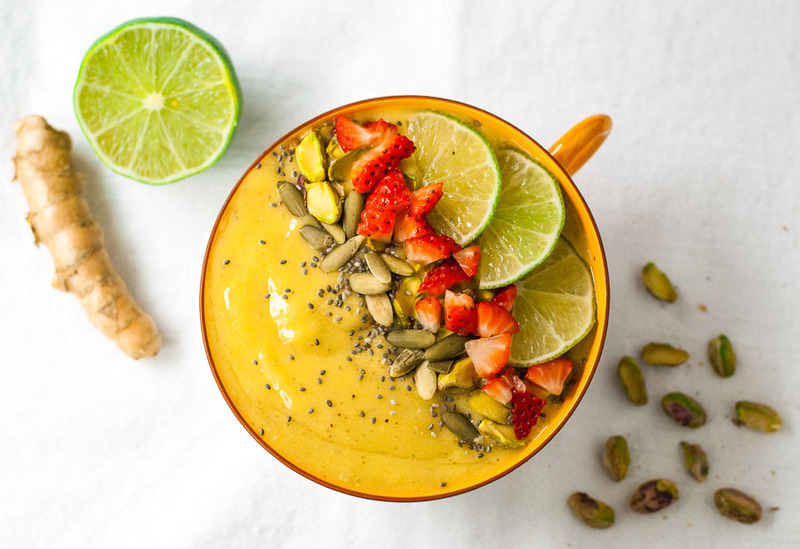 This tropical turmeric smoothie also contains fresh ginger, another food chock-full of antioxidants and anti-inflammatory compounds. 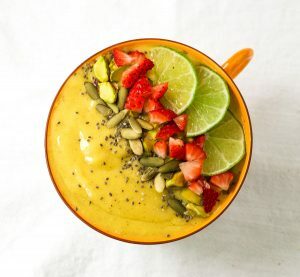 The fresh turmeric and ginger combined with vitamin-packed fruits and fiber-filled chia seeds results in this refreshing, immune-boosting smoothie. And if you make it with frozen fruit, it will be thick enough to make a pretty smoothie bowl with whatever toppings your heart desires. 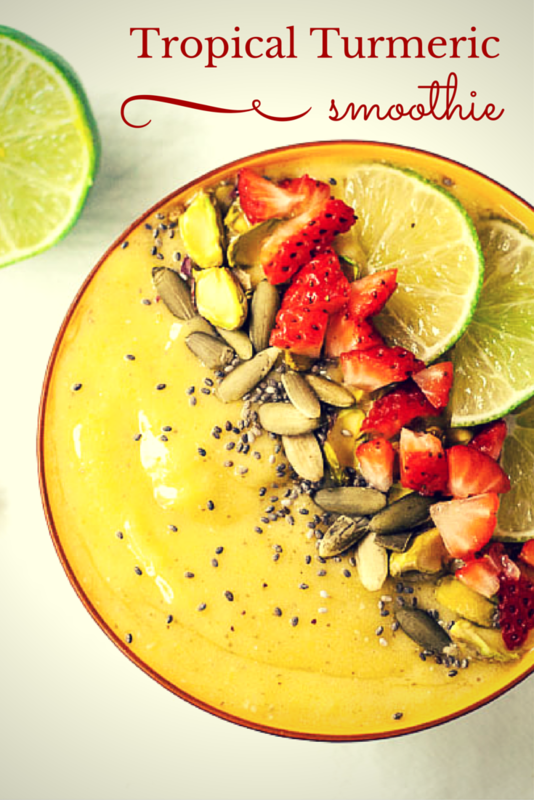 If you want to make a smoothie bowl, use frozen mango, pineapple, and banana. Previous Post: « Are Nuts a Healthy Option? This looks incredible, Esther!! Would you mind if I used this on my blog? Thank you Miranda. Yes I would be honored to have you use this on your blog. 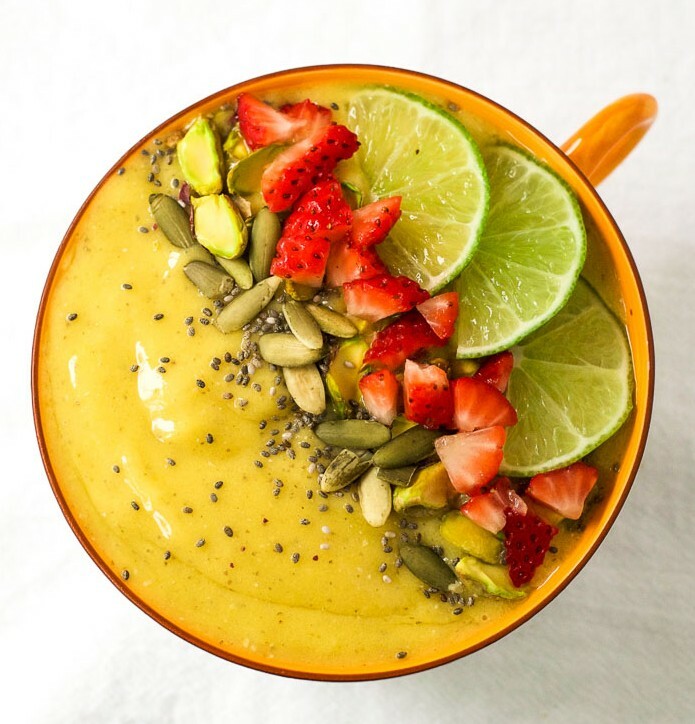 All those wonderful toppings make this smoothie so special! Delicious – thx for posting!